There are currently 85,001 users on this website. Mexico City Recortadas Aka Klippes -- How Were They Made? 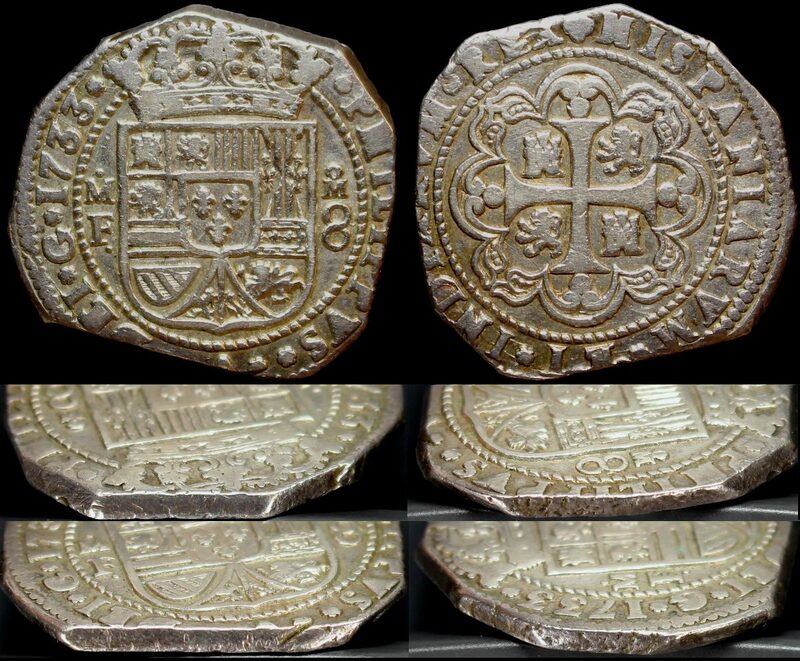 Quick background -- the royal decree of 1728 set the Spanish colonial mints on course to produced milled coinage. 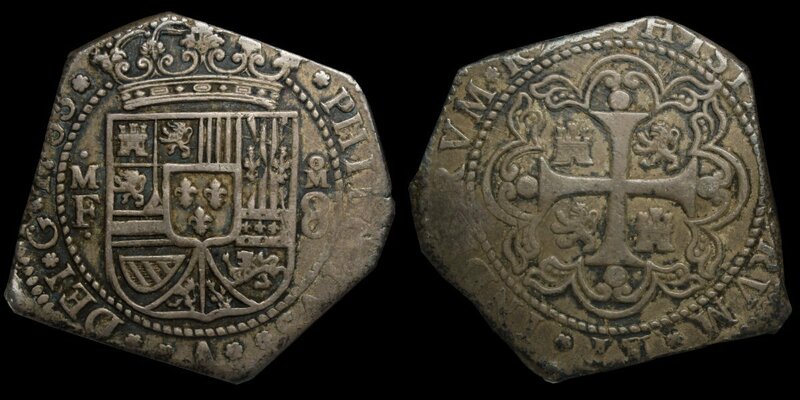 The Mexico City mint began to issue milled coins in 1732 but continued to issue macuquina aka cobs to maintain quotas until the new milling process could come up to speed. 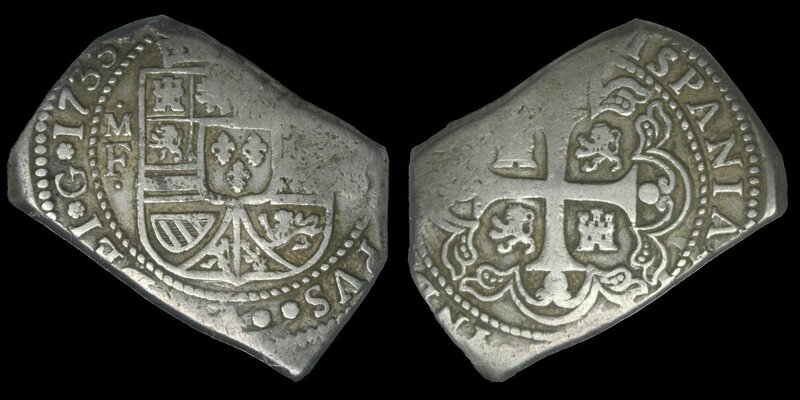 In 1733 and 1734 a third type, the recortadas or klippes were issued, presumably to cover the manufacturing shortfall of the milled coins. They have odd shapes, like cobs but were clearly struck on the screw press as evidenced by their uniform thickness. In addition, the design is similar to the cob style but a distinct variation. So how were these made? Were these made like cobs and struck in the screw press or, like the coinfacts wiki page states, were they cut from milled strips? From swamperbob's comments on the milling process, it seems like much of the labor is involved in preparing the strips as numerous annealings, passes through the rolling mill, acid baths plus a laminating step were required to prepare the fillet. Would that much effort be saved by skipping the stamping and upsetting/edge milling steps? Is it even possible that cobs, with their odd thickness, could be struck in the screw press? Here are a few of my examples. Search me, but that article on cob reales production was educational for me. Could these have been trimmed down after being struck to normalize their weight? The first example you show has at least four cut lines on it, maybe more, while seemingly maintaining a somewhat circular shape. I believe that cobs were trimmed after being struck and then worked to remove the sharp edges. Seems logical that the same would have happened to these klippes, too. Here's an interesting description of cob making. Sedwick reports that silver "straps" (or riels - very few survive, but he shows a photo of one, along with a reassembled line of sequential cobs) were made using a measured amount of molten silver poured on a slab. No thickness control, no annealing. The cooled riel was divided by balancing and cutting at the balance point, repeating the balancing and cutting until the planchets were made. An 64 reales riel thus generated 8 - 8 reales planchets without using a scale. Klippes look too neat and tidy to be made from cob planchets. They appear to be chopped out of a uniform thickness sheet. I enjoyed reading the two articles. I have read about cob production before. That seems straight forward. Milling as a process is about as straight forward. The intermediate step may have been as jgenn suggests simply an expedient to produce more "finished" coins. Based on my reading of historic coining techniques, production involved several distinct processes which were performed by different work crews in different rooms of the mint. The process was therefore more like a series of distinct steps each of which operated in a mini-world of its own. Transfers of finished product from step to step out of necessity must have involved a sign-off process to insure there was no loss of silver along the way. So it would not have been a smooth even speed process like a modern factory with an assembly line. It could be viewed as a series of tiny assembly lines with needed pauses in between steps for inventory taking and official transfer of materials. All salaries were ultimately paid for by coinage production. The more finished coins that were produced the more workers earned. Therefore innovations that favored increased production were constantly under development. More staff would cut salaries by dividing the pot into more piles. So more people to expedite output was not ideal unless the added people increased the output enough to offset their salary AND MORE. Initially planchet production had to be the bottleneck. It was a new process that was as noted rather complex. A screw press actually requires a metal planchet that is of uniform thickness. Note it is uniformity of each blank and not consistency of thickness I am talking about. Coins struck on planchets that vary in thickness makes for BAD coins. The struck up detail is not uniform over the entire surface and too great a difference in thickness means a number of strikes will be needed to even approach a complete strike. A worse scenario would be if the irregularity cracked a die. Therefore I would contend that the new process introduced a bottleneck. Questions that needed addressing were how many machines were needed for rolling, laminating, washing and annealing and how many men were needed to operate the machines to produce enough planchets to keep the screw presses busy during the maximum number of working hours. I would further contend that the strap method of planchet production could not be used to make the planchets for a screw press. The end product would be too irregular and would unnecessarily stress the dies. Edge milling was also a new process introduced at the time of the screw press but this step took place after the planchet was struck in the screw press at least until after 1755. Before that date both methods of pre- or post- strike edging seem to have been employed. This to me at least confirms that the planchet preparation step was causing trouble in production. So why klippes? It makes sense to me that a simple rolled strip of silver (rough rolled to approximately the correct thickness) makes sense. Rolling the fillet to a rough thickness would be quicker and the need for laminating would be eliminated if production quantity not quality was the objective. The rough strip could be cut into rectangles or squares. If the strip was rolled extra thick - the corners could then be clipped off to make the adjustment. Since most 8Rs were made to conveniently transport silver metal rather than to produce coins for long term circulation, the quality of the coin did not have to be perfect. Here's an oddity....a 1733 press strike on a cob flan rather than a klippe. The coin press produces a much better strike than hammering, but the detail is lost at the irregular thickness edges compared to a klippe. I think that's just a hammered cob on an unusually flat blank based on the design. The klippe design has the mint mark above the 8 on the right side of the shield and the assayers on the left side of the shield. I would refer to jgenn for the details of the die being a Klippe or not. I do agree completely that this planchet was unusually flat and uniform in thickness for a cob. It has the normal shape of a planchet cut from a strap. It would of course be possible to strike a flattened cob on a screw press as long as the planchet was fairly flat and of uniform thickness. Mexico cobs from 1733 are cruder looking than the above example. Could a cob die have been used in a coin press? Here's a 1726 Potosi 8R cob die. It appears to be 2-3 inches tall, with evidence of considerable pounding. Could a cob die have been used in a coin press? Initially I thought obviously the answer is NO. The dies are not the same size or shape. On reflection I realized the wide hammering surface of the die could possibly be cut down to fit the chuck on a press. That in my opinion would be a lot of effort. So the question becomes for what reason would that be done at a mint? The only answer I can think of is that the screw press crew broke the last die pair and needed something to keep production going. It would be quicker to cut down a spare cob die (of the type shown in the auction) and fit it to a screw press than it would be to wait for a new die pair to be made. No one can know that but yes it is possible. Regarding 1733 8R coins in general, I have never done an in depth study of the genuine coins with that date, but as a collector of counterfeit coins of all types I can tell you with no reservations that this date is one of the most popular targets for numismatic forgery there is. They were around in the early 1960s and people I spoke with back then indicated they had been produced for decades then. I see them as inherently a dangerous item to collect without serious historical and scientific analysis. Specific gravity testing would be of some help in eliminating some modern fakes. Porous coins might present difficulty but solid coins would not. Perhaps someone with adequate time can determine from historical records where the raw silver came from that was used in 1733 at Mexico City. If the same sources were in use in 1733 as were in use in 1775 - then I would use XRF to look for gold which MUST be present. Coins with less than 200 PPM in detectable gold would be modern fakes made anytime AFTER 1889. I know someone will ask about sea salvaged coins. Gold is NOT reactive in sea water (look at the condition of gold recovered from famous shipwrecks for proof) so I would expect there would be more gold detectable at the surface not less. I know for a fact that counterfeiters in the 1930-1990 time frame did not anticipate the advent of testing that could detect 200 ppm gold content and more critically no one knew that this trace contamination even existed. Thanks for your insights on historic coining techniques, swamperbob!